Well-acclaimed Oncologist, Dr. Surender Kumar Dabas, has recently joined BLK Super Speciality Hospital. Dr. Dabas is a distinguished mentor and specialist in the highly advanced field of Robotic Surgery and has vast experience in head and neck malignancies. He has joined BLK Hospital as the Chief of Robotics Surgery and Director of Surgical Oncology Department at our newly upgraded BLK Cancer Centre. 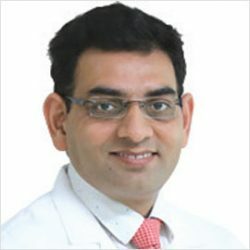 Before joining the team of experts at BLK, Dr. Dabas was previously engaged with some of the leading medical institutes in the country including Rajiv Gandhi Cancer Institute and Research Centre as Chief of Head and Neck Oncology and Robotic Surgery, and Fortis Memorial Research Institute as Director of Head & Neck, Breast and Thoracic Services. A leading pioneer of Robotic Head and Neck Surgery in India, Dr. Surender Kumar Dabas has a vast experience in Oncology and is an international mentor of Robotic Surgery. His Clinical focus is on Head and Neck Oncology, Trans-Oral Robotic Surgery, Robotic GI Surgery, Thoracic Surgery and Gynecological Surgery. He has been actively involved in teaching Robotic Surgery across India. He has done the maximum number of Robotic Head and Neck Surgery in Asia. He also has numerous National and International publications under his name. Equipped with state-of-the-art equipment, facilities and experienced faculty and staff, BLK Cancer Centre offers personalised and comprehensive cancer care. With a patient-centric multidisciplinary approach, our medical and administrative experts work seamlessly to ensure the entire medical needs of our patients are handled meticulously. The ‘Combined Management’ approach of the centre helps us optimise patient care to a highly personalised level. At BLK Super Speciality Hospital, our mission is to advance patient care, education and research to change the course of cancer care.